It is the model to do a function like a torque converter of the real car and for the principle of the fluid-mass clutch to be able to be easily in using transparent material for a distributor-body confirmed. 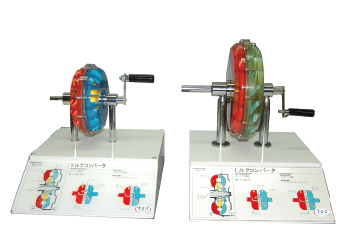 Because the oil of the inner enclosing, too, is using transparent material, the pump impeller ( the red wing ) magneto stator ( the yellow wing ) turbine runner ( the blue wing ) inside can be watched. When turning a handle slowly, the body turns and the body and the pump impeller ( the red wing ) inside begin a revolution.